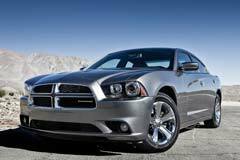 A used Dodge Charger once reflected America's love for its classic muscle cars and now it exists as a modernized sedan. The new four-door Charger is similar in design to some models made by Mercedes, but at a much more affordable price. The front-end styling and rear roof line slopes contribute to its visual appeal. Certain models come with a 3.5-liter 292-horsepower V6 engine, which is known for good fuel economy. Others will come with a much more powerful V8 engine. Getting 25 or more miles per gallon on the highway is not out of the question with any used Dodge Charger. Five-speed automatic or an eight-speed automatic transmission is available based on the particular model. The interior of these cars can be quite spacious and electronic amenities that are found in the more recent models are an added bonus. An engine immobilizer offers enhanced safety as does the excellent braking system. 2015 Dodge Charger 2015 Dodge Charger RT Road & Track Must see!